, Friday, April 22, 2016 — Wellington, FL (April 22, 2016)— With the Equestrian Sport Productions (ESP) Spring Series in its second week of competition in Wellington, Florida, horses and riders are enjoying competing in the international ring with near-perfect weather conditions. 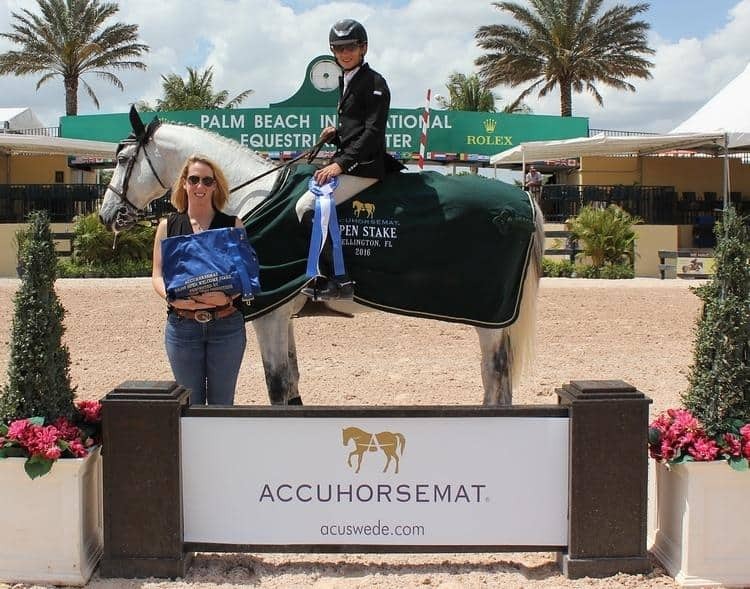 Accuhorsemat, a non-invasive acupressure horse blanket that promotes healthy circulation and relaxation, is sponsoring the ESP Spring Series for the first time this year. The company was the title sponsor of Thursday’s $10,000 Accuhorsemat Open Welcome Stake, and was excited to award the class’s winner with an Accuhorsemat blanket of their own. Fifty-three competitors from all over the world competed in the $10,000 Accuhorsemat Open Welcome Stake over a course that saw 17 clear first rounds. After several blazing-fast jump off tracks, Mark Bluman and his Swedish Warmblood partner Thriller P posted a time of 31.001, which proved unbeatable for the remaining riders left to compete. Thriller P was recently purchased by Stransky’s Mission Farms, who owns many talented jumping horses that compete across North America and Europe. Bluman, who rides for the nation of Columbia, has had a successful season with a strong string of horses, which now includes the 12-year-old grey gelding Thriller P.
For equine enthusiasts looking for a way to improve their horses’ wellbeing using a simple and innovative solution, Accuhorsemat offers a non-invasive acupressure horse blanket. The blanket is designed to promote healthy circulation and recovery through increased blood flow, toxin release, and muscle relaxation. Based on ancient acupressure practices, the Accuhorsemat stimulates acupressure points across the body of the horse to help relax muscles and relieve pain. The specifically targeted acupressure points increase blood flow to the horse’s muscles, allowing them to relax and recover faster after training and competition sessions. The Accuhorsemat can also be used before riding to calm and relax a horse as it soothes muscles and promotes endorphin release. As part of his prize, Bluman was awarded with an embroidered Accuhorsemat, commemorating his win for the $10,000 Open Welcome Stake. He was also presented with a prize cooler, and $2,700 in prize money. More information about Acuswede and its products can be found at www.acuswede.com. You can also find Accuhorsemat at the famed Rolex Kentucky Three Day Event, presented by Land Rover. The competition will be held at the Kentucky Horse Park in Lexington, KY from April 28-May 1, 2016.